In May 2011, I took part in an incredible two-week study tour of Buenos Aires, Argentina, one of my favorite places in the world. The trip was offered as a graduate-level course through the University of Massachusetts, Amherst, and was taught by professor Eve Weinbaum of the UMass Labor Studies program and her husband, Max Page, a prof in the Art, Architecture and Art History Department. Including the Weinbaum/ Page family, 18 of us were on the study tour. As a writer, I’m allergic to anything that smacks of psychobabble, and usually I can’t stand it when other bloggers include “trigger warnings” before their posts. But in this case I feel compelled to warn my readers: This post discusses state-sponsored torture and murder. I try to not be too graphic, as the point is not to disgust or frighten anyone. But this is a topic in which I’ve been interested since the early 1980s, as a U.S. and world citizen opposing the U.S. government’s and military’s funding and support for regimes forcing neoliberal policies on their people. For more on this process, I highly recommend Naomi Klein’s book The Shock Doctrine, parts of which were required reading for our course. Klein describes the process more compellingly than I ever could. I’m also indebted to Marguerite Feitlowitz for her informative and difficult book A Lexicon of Terror: Argentina and the Legacies of Torture. ESMA’s main building, the Casino de Oficiales. 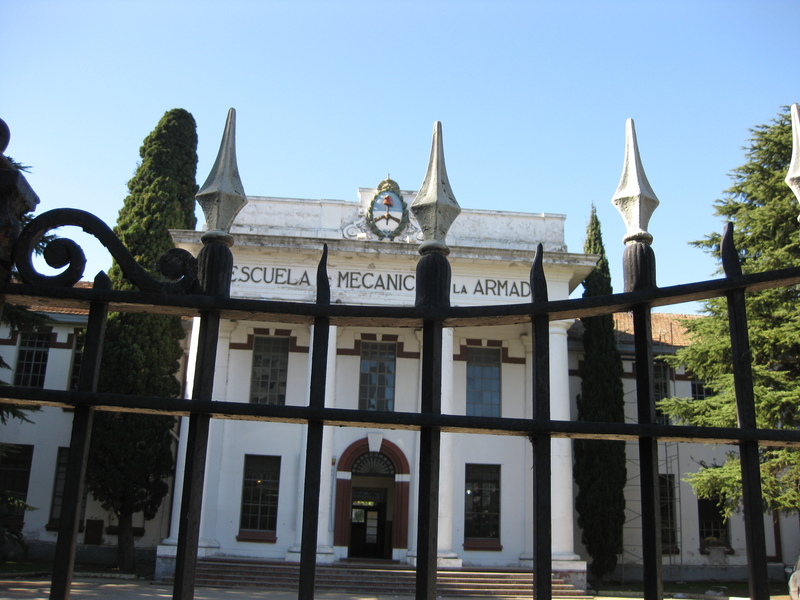 La Escuela Superior de Mecánica de la Armada, the Navy Mechanics School, was one of the most infamous torture centers of Argentina’s 1976-’83 dictatorship. 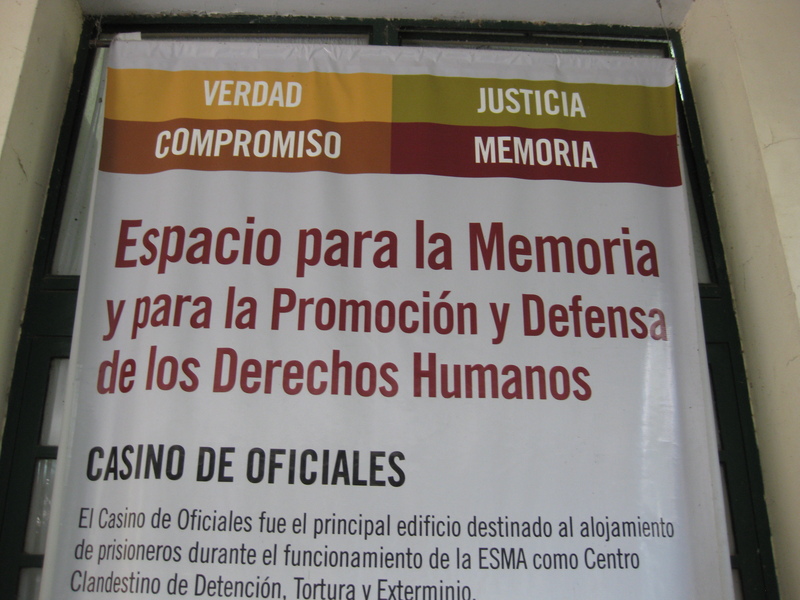 About 5000 prisoners passed through ESMA; as with the military junta’s other clandestine detention centers (CCDs in Spanish), the vast majority of prisoners were kidnapped off the streets or buses or from their homes, kept for months or years, tortured using electric shock and other brutal methods, and killed. In many cases their loved ones never learned of their fate – thus the term detenidos-desaparecidos (“detained-disappeared”) is still used today. 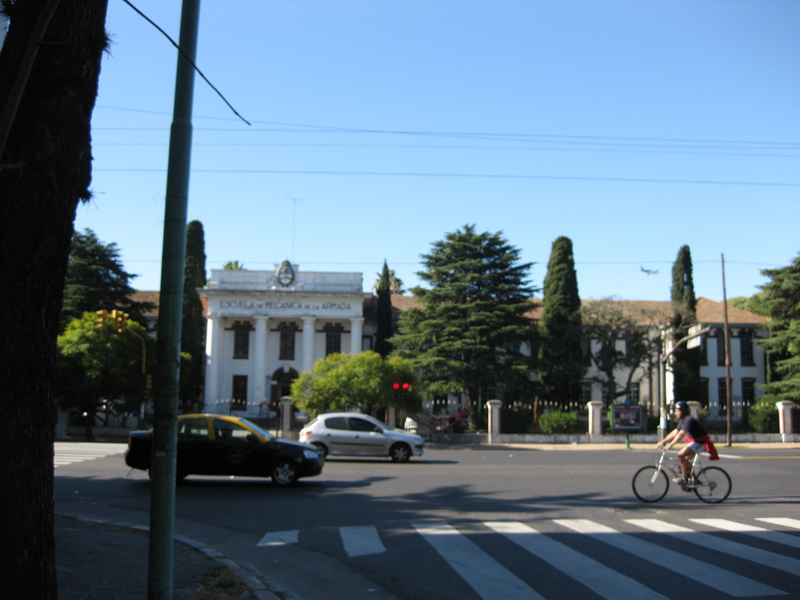 ESMA is in the northern part of the city, near the Río de la Plata. 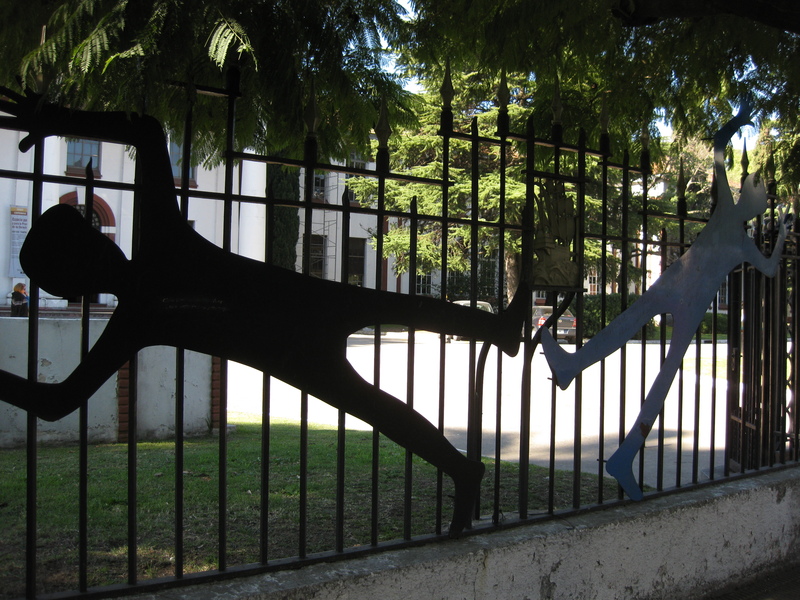 It’s so close to the River Plate team’s soccer stadium, occasionally the desaparecidos could hear the fans shouting. But ESMA’s administrators are infamous for other inhumanities. Pregnant women weren’t exempt from torture; many were kept in isolation, then moved to small rooms before they gave birth. The infants were taken from their mothers and illegally adopted by parents inside and connected to the country’s military apparatus. 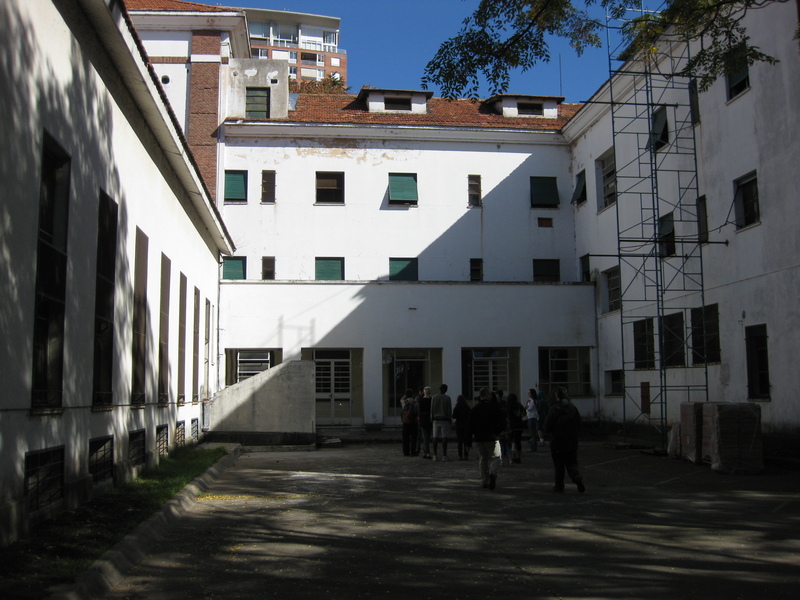 ESMA was also the site of the Navy’s “recuperation process” for the prisoners they’d deemed “subversive” but eligible for “reeducation” – during the day these detenidos-desaparecidos worked in administration and media production, then were returned to their hoods, shackles, and cells in the attic at night. The word “capucha” refers to both the hoods that the prisoners were forced to wear over their heads and necks, and the attic where they were kept in “camarotes” or “tubos” (“cabins” or “tubes”), cells not much larger than coffins. Those not working for the military were in Capucha around the clock. Many of the desaparecidos at ESMA ended up on the death flights – sedated and placed on airplanes, then dropped, still alive, into the Rio de la Plata or the ocean. Only about 200 prisoners survived ESMA. 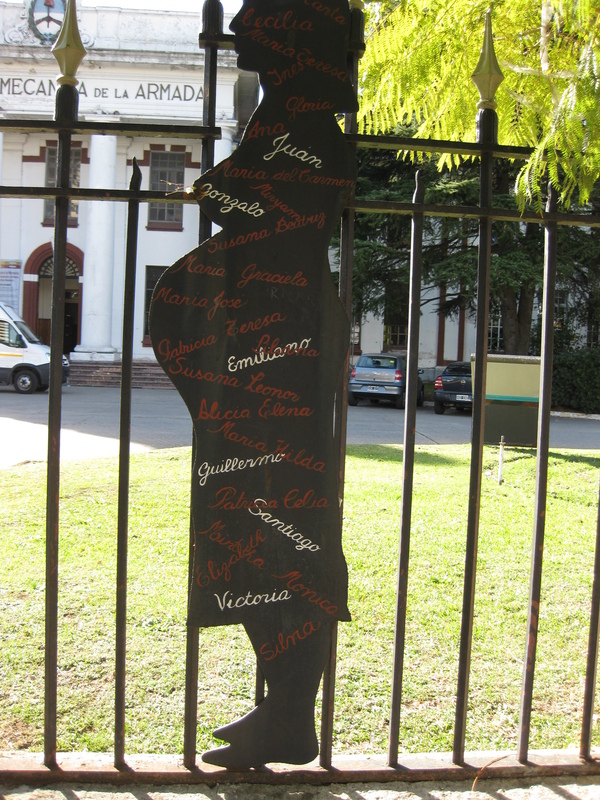 Figure of a pregnant detenida-desaparecida on the ESMA fence. These human figures were used in demonstrations by the Madres de la Plaza de Mayo. After reading extensively about this history, I felt more than a little trepidation about visiting ESMA, and I was nearly incredulous that we were beginning our trip there, when it felt as if we’d barely stepped off the plane. It seemed a bit like setting off on a European tour that started at Auschwitz. I had visions of viewing the cells in the attic and collapsing into a weeping heap. But I found that ESMA was disturbing, but not gruesome in the way I’d feared. In what became the norm for this trip, a savvy, understanding young person led our tour and created a fantastic learning opportunity for those who hadn’t delved into ESMA’s history as deeply as I had. Pablo was a graduate student in philosophy who’d been working at ESMA’s Espacio para la Memoria since 2007, before it opened to the public. “I’m glad you’re here; it’s very important for people from the U.S. to visit the ESMA,” Pablo told us. I just about nodded my head off in agreement. Pablo with the map of ESMA. Some of my compatriots were not as thrilled. Several days after the tour, I learned that Pablo’s direct gaze had been too much for some of the younger members of our class, who said his “staring” at them had made them uneasy. I hadn’t even noticed it, but after listening to them I realized I’d been utterly comfortable – this was the person educating me about a site of genocide, and as far as I was concerned, he’d better be able to look me in the eye and make a personal connection. This topic had come up in one of my Spanish classes a few weeks before the trip to Buenos Aires, when one of my classmates had asked what the word for “creepy” was in Spanish. Our instructor said the concept didn’t translate too well, that certain behaviors considered disturbing in the U.S. weren’t viewed that way in Latin America, including fixing someone with a direct gaze. I also appreciated that Pablo talked about the role of neoliberalism and the U.S. in the last Argentine dictatorship. He discussed the School of the Americas, where since 1946 the U.S. has instructed more than 64,000 Latin American military personnel in, as the School of the Americas Watch website puts it, “counterinsurgency techniques, sniper training, commando and psychological warfare, military intelligence and interrogation tactics. These graduates have consistently used their skills to wage a war against their own people. Among those targeted by SOA graduates are educators, union organizers, religious workers, student leaders, and others who work for the rights of the poor. Hundreds of thousands of Latin Americans have been tortured, raped, assassinated, ‘disappeared,’ massacred,” and forced into exile by those trained at the SOA. These are precisely the people, citizens and workers from other countries, who were the victims of the represores in Argentina. As Pablo mentioned, the U.S. government also heavily supported Operation Condor, another military/political program utilizing “intelligence” for targeted repression and assassination, beginning in the mid-’70s with the dictatorships in Argentina, Brazil, Chile, Paraguay, and Uruguay, and later including Bolivia and Peru. Henry Kissinger, the U.S. secretary of state under Richard Nixon and Gerald Ford, is still being pursued through various nations’ legal systems to testify about his involvement in Plan Condor, and at times has had to alter his international travel plans to avoid subpoena. From the main entrance to the naval complex, Pablo led us to the Casino de Oficiales, or officers’ living quarters, which also served as the ESMA’s CCD during the dictatorship. As our architecture professor, Max Page, pointed out, this produced a bizarre intimacy with those the navy was holding captive: the prisoners were being tortured in the basement and barely surviving in the attic while the officers lived and dined on the upper floors. While we toured the building, Max discussed with us a question of historic preservation that had arisen when activists from many organizations began to debate what to do with the ESMA after the navy finally turned the property over to the federal government. In 1979, before the Organization of American States sent in a delegation to investigate reports of torture and disappearance in Argentina, the navy killed a huge number of prisoners, then shipped the survivors off to an island in the nearby Tigre Delta. The represores also altered the Casino, removing an elevator and extending the back of the building, an attempt to discredit reports from survivors about the Casino’s layout. When ESMA officially became a memorial site in 2004, those working on the project had to decide whether to restore the building to its original state, or leave the alterations as part of the historic record; they pursued the latter course. We could see where the elevator had been – an ordinary looking corner, but sinister when one knows ESMA’s history. The door to the sótano, or basement, of the Casino. Photography is not allowed inside the building, as evidence is still being gathered there for ongoing trials of the ESMA perpetrators. The Casino’s basement and attic, too, seemed unremarkable. The former always contained a torture room, which was called la Huevera because egg cartons were used to line the walls in an attempt to muffle the victims’ screams. 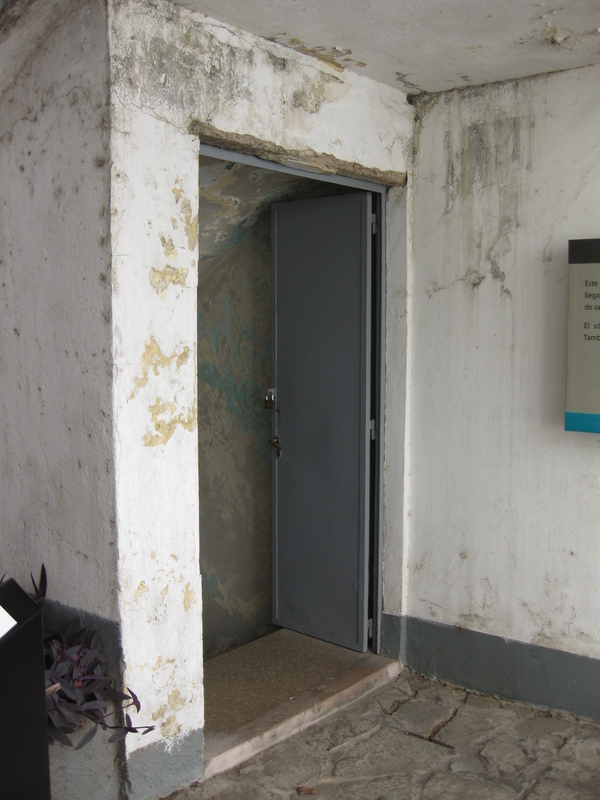 At various times the basement also housed an infirmary, a photo lab, and offices where selected desaparecidos were forced to translate documents, take photographs of other prisoners, and churn out propaganda for the military. Later these offices, the small press archive, and the library were moved upstairs to the left side of the attic, where the prisoners worked with closed-circuit TV cameras surveiling them – this area was known as la Pecera, the “Fishbowl.” Other parts of this wing were used to store the furniture, clothing, and other personal possessions the military had stolen from the homes of those they kidnapped. Another, smaller attic, “Capuchita,” was used by the navy, army, and air force to torture and house prisoners under more atrocious conditions than in Capucha. Parking area behind the Casino, from which desparecidos were “transferred” — usually a euphemism for being taken to the nearby airport, flown over the river or the ocean, and drowned. Now the basement and Capucha are empty, the floors and walls clean, the vast spaces holding only informational signs and floor plans of the rooms that used to exist there. 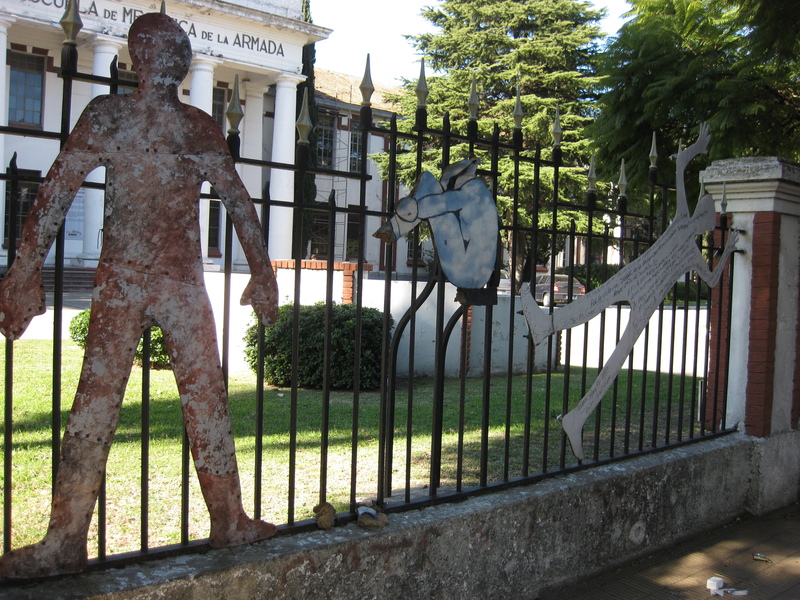 And simple plaques with statements, in Spanish and in English, of survivors who testified before the CONADEP, el Comisión Nacional sobre la Desaparición de Personas (National Commission on the Disappearance of Persons), which began investigating the genocide in 1983, during the term of democratically elected president Raul Alfonsín. The commission, headed by writer Ernesto Sabato (who died in April at nearly 100 years old), documented the forced disappearance of 9000 people in Argentina between 1976 and 1983. Estimates of the total number of detenidos-desaparecidos range from 11,000 to 30,000. After our 3-hour tour, Pablo led us back through the first floor, past the large dining room where the officers used to eat their meals, and outside, where I blinked at the ordinariness of a warm, sunny day. I realized suddenly that the entire predio (naval base) had an unremarkable feel to it. It’s a pleasant place, in fact, when one is outdoors – white stucco buildings with red tile roofs dot the green lawns; mature trees shade the lanes between. As we were there in May, the South American fall, the trees were turning rich shades of russet and chestnut. The ESMA is now the largest human rights museum in Latin America. 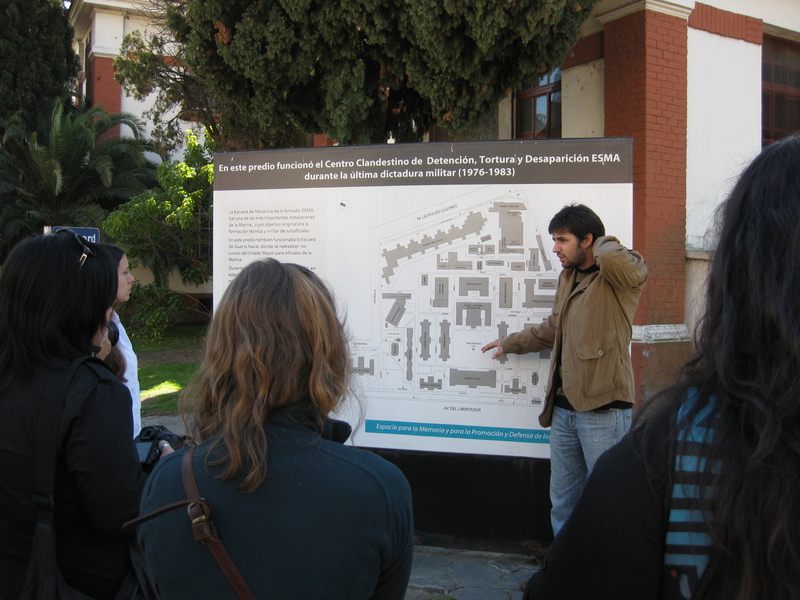 The complex contains more than 30 buildings, several of which house cultural centers of various human rights groups, including both groups of the famous Madres de Plaza de Mayo. The Argentine Forensic Anthropology Team, which has assisted in identifying human remains after wars and so-called ethnic cleansings in 30 countries in the last 25 years, has its office there, and other buildings are earmarked for various uses. 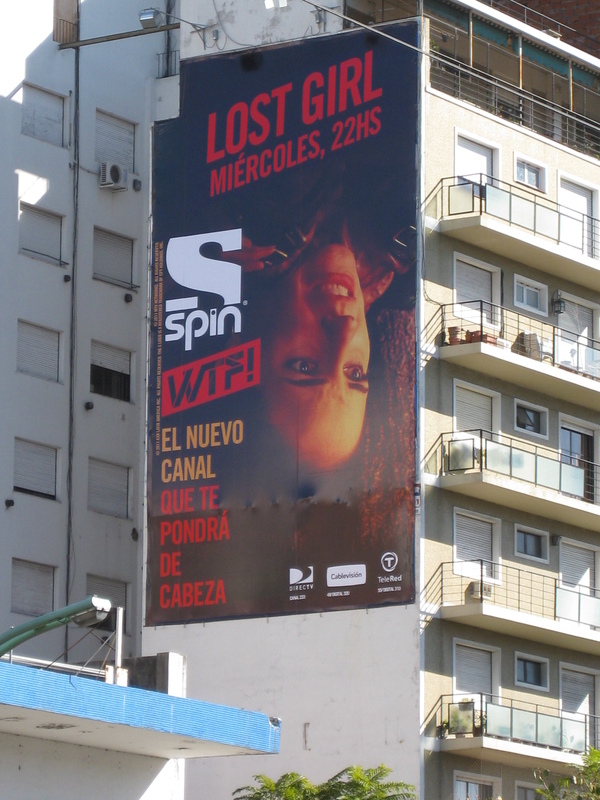 On the apartment building across Avenida Libertador from ESMA, a gigantic billboard advertising “Lost Girl,” who seems to be hanging upside down in great distress. Creepy. As our group left the ex-ESMA, I picked several glossy leaves from the ground and put them into my jacket pocket, planning to press them under the stack of books in my hotel room as a reminder that life continues even when human beings are doing incomprehensible things to each other. 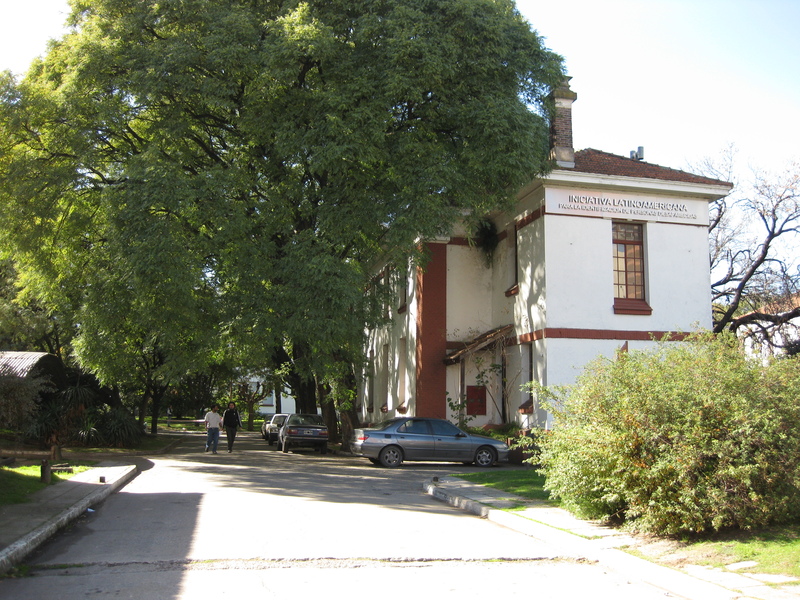 This entry was posted in Argentina, Latin America, Travel, Uncategorized and tagged Buenos Aires, desaparecidos, Escuela Mecanica de la Armada, ESMA, human rights museums, torture. Bookmark the permalink. Thanks for reading! I just checked the Argentine government website for information, and I’ll add that to my post’s links. I don’t know if you speak Spanish, but I would think that if you send email to the following address, someone could reply in English, as many Argentines know at least some English. I have no idea whether they have regular tours that you can join, but I believe they have a number of student volunteers who are fluent in English. Good luck, and let me know if you reach anyone! Suerte! Excellent article, I’ll be visiting ESMA next month. In 2015 I visited Museo de la Memoria in Cordoba, another haunting place well worth going to. Thank you, Garry. I’ve seen photos online that show ESMA as a much more informative museum these days. I’ll have to visit the museo in Córdoba the next time I’m in Argentina.